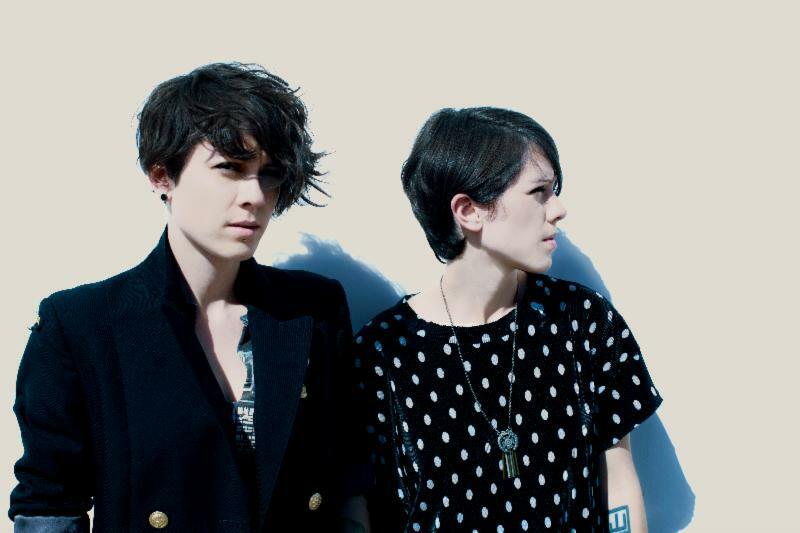 This past weekend, Canadian duo Tegan and Sara claimed a total of three awards at the 2014 Juno Awards. The girls lead the way for all Juno nominees. Their seventh studio album, and commercial breakthrough Heartthrob, earned them their first three Juno Awards – Pop Album of The Year, Single of the Year (“Closer”), and Group of the Year versus fellow artists such as Robin Thicke, Arcade Fire, Michael Bublé, and more. The Calgary-born twins also performed their hit single “Closer” on the Juno Awards show broadcast nationally Sunday evening. After a great first run with “Closer,” the girls are launching their second single from this album cycle this spring, “I Was A Fool,” the follow up to their wildly successful first single. Tegan and Sara will be kicking off their “Let’s Make Things Physical” headlining tour this spring with dates including a stop at NYC’s Hammerstein Ballroom, and back-to-back nights in DC and Chicago in addition to some massive performances at slew of summer festivals, all followed by a stint with Katy Perry on fall’s “Prismatic” tour. For a full list of confirmed dates, see below. Saying goodbye is never fun. Saying goodbye to a band is definitely not fun. My Chemical Romance have been gracing our ears since 2001, with music that, if you bothered to argue, could define a generation (if not just for a period of time). However, in true My Chem fashion, they aren’t leaving without a theatrical, extraordinary exit. This flourishing goodbye comes in the form of May Death Never Stop You, their final album, and a nod to the fans. Consider this their collection of greatest hits, which you can order with a DVD full of never before seen footage. “Fake Your Death” is a perfect underdog anthem that really illustrates the concept of choosing your own fate, as well as the idea that life isn’t always fair. Lyrically, the previously unreleased track is wonderfully pieced together, witty, and poetic. This will easily find its way into listeners’ top ten My Chemical Romance favorites, if not just for the pure rock and roll soul that embeds itself into each line. This video is the perfect summary of their career, and a great goodbye. One thing I used to love about “emo” (excuse the label) music was the obscure titles that were long, strange, and cheeky; Fall Out Boy set the standard high with titles that weren’t pulled from the lyrics. “Honey, This Mirror Isn’t Big Enough For The Two Of Us,” is the perfect flashback to that time, as well as My Chemical Romance’s early sound. It’s noisy, youthful, and full of angst, letting us all revel in the sound of our own garage-band infused adolescence. Stripped from the same album, “Vampires Will Never Hurt You” provides the same effect. One of My Chemical Romance’s better known earlier tracks, to hear it now reminds listeners of the promise the band showed even in their early days, even going as far as predicting the new wave of pop-culture obsession: vampires. I can distinctly remember hearing My Chemical Romance or the very first time. In all truth, my cousin was obsessed with Three Cheers For Sweet Revenge. She showed me the videos for “Helena” and “I’m Not Okay (I Promise)” and I pretended to be uninterested, but as soon as she walked out of the room, I was humming the melodies under my breath. Needless to say, I’ve been an MCR fan ever since. Whenever I hear those tracks, I am immediately taken back to that day, still fascinated by the boys wearing eye makeup and all black. The beauty in “Helena” is the melancholy tone of the lyrics, the resignation to loss, contrasting with the fast-paced instrumentals that bring the sound full-circle. “I’m Not Okay (I Promise” has remained my ultimate favorite song from the band, and the video may have a lot to do with that. As a kid, that video was gold to me, and it’s still probably my favorite music video I’ve ever watched. The track is clever, blunt, honest, and it’s got solid instrumentals to boot. The guitar solo is enough to make you stop dead in your tracks. Just hearing a few songs from Three Cheers… makes me want to play it on a loop, just for the nostalgia it provides. Of course, every person in the world remembers The Black Parade, adoring it from the opening notes of “Welcome To The Black Parade.” To see it alongside My Chem’s other hits is almost enough to make listeners grin in pride, especially those of us that recall the debut of these songs, and the attention they received on TRL (Tweens who read this blog: yes, MTV used to occasionally talk about music and play good music videos that didn’t involve teen pregnancy or Snooki). From “Welcome […]” to “Famous Last Words,” the few tracks from The Black Parade still have the same effect of making you want to sing and jump and slide across the kitchen floor on your knees like you’re Freddie Mercury at Wimberly Stadium (oh, is that just me?). Not to be excluded are the hit singles from the band’s Danger Days […] album, which, when placed alongside their older music, places a spotlight on the growth of each member, and of the group as a whole. Finishing off with tracks from Dreams of Stabbing and/or Being Stabbed, My Chemical Romance bring their final album full-circle with demos that sound like being back at the beginning once again. If I were a conspiracy theorist, I would say these demos, along with the ironically titled, “Fake Your Death,” were signs that My Chemical Romance were about to pull off the greatest April Fool’s Day prank in history. However, let’s call a spade a spade and just admit that it’s time to say goodbye. Unlike many “Greatest Hits” compilations, My Chemical Romance strayed from the mash-up of their musical eras, placing them in perfectly timed chronological order. Like an audible diagram of their evolution, listeners new and old will get to experience moments from the band’s beginning to their last hurrah. Widely known as the original “Space Ace” and founding guitarist for 16 cumulative years (over 2 tenures) of the multi platinum selling rock band KISS, Frehley is one of the most popular original members. Along with having the best selling solo album career (vintage or current) among the original foursome, Frehley’s self-titled album, released in 1978, went on to sell over one million copies, producing the only Top 40 single, “New York Groove,” from any of the legendary KISS solo albums (peaking at #13). 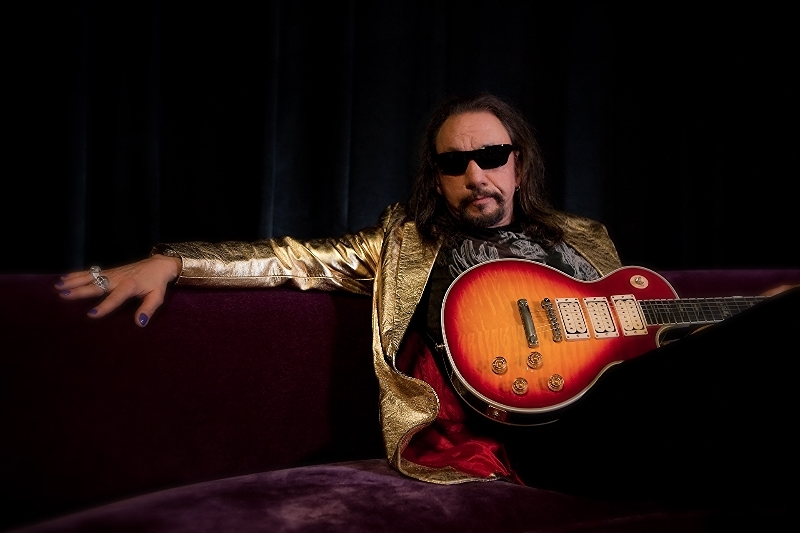 Ace Frehley will participate in the 2014 REVOLVER GOLDEN GODS AWARDS show by presenting the Dimebag Darrell “Best Guitarist” Award alongside label-mate Zakk Wylde. The awards show will take place on April 23, 2014 at the CLUB NOKIA Theater in Los Angeles. Tickets are on sale now! The newest acoustic session from photographer Ryan Russell’s “Nervous Energies” is now live and features Detroit, MI natives, Fireworks! The song “Run, Brother, Run” is taken from the band’s newest album Oh, Common Life, which was released March 25th. The session can be seen now HERE. 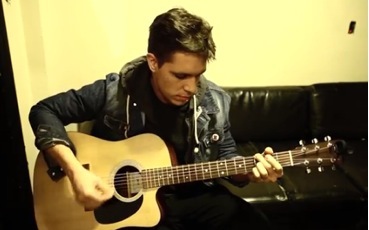 Past Nervous Energies sessions include Against Me!, Bad Books, The Menzingers, New Found Glory and many more. You can purchase Fireworks’ new album Oh, Common Life, can be purchased digitally now on iTunes, physically through Merch Direct, as well as on stops of the band’s current tour. Hot Topic stores are carrying an exclusive, orange vinyl pressing of the record. When purchased physically from select indie retailers, fans will receive a 3 song acoustic EP which includes a brand new, never before heard song! A full list of participating retailers can be seen HERE. The band is currently touring North America with The Wonder Years, Real Friends, Citizen, and Modern Baseball. The tour has already sold out many of the scheduled dates. Fireworks is also confirmed for this year’s Bled Fest in Howell, Michigan on May 24th with The Menzingers, Title Fight, Man Overboard and many more. Tickets for the festival can be purchased at HERE. 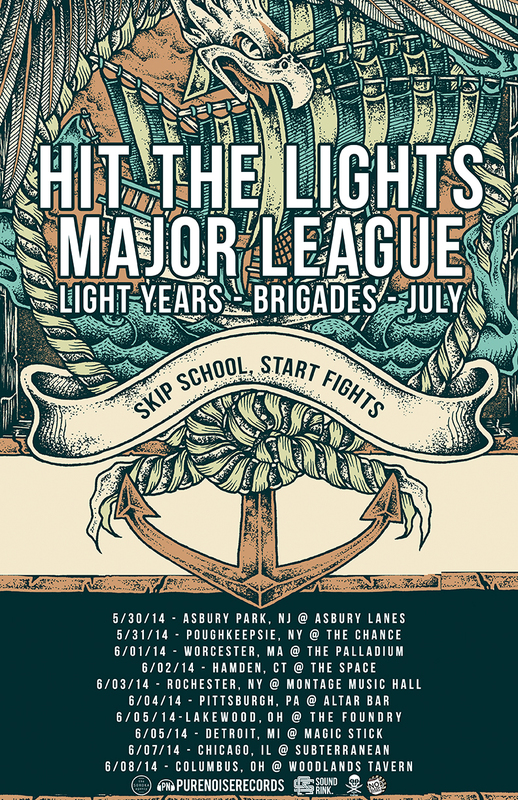 HIT THE LIGHTS, the pop-punk five piece from Ohio, have announced the supporting acts for their “Skip School, Start Fights” tour, as well as launching a VIP pre-sale for the dates. Below, you will find links to the bands touring, as well as tour dates. Johnson’s success in TV and film as a young adult (Instant Star, So Weird, Final Destination 3) not only landed her a Gemini Award (Canadian Emmy) in 2008, but also helped her garner a massive grassroots fan-following, supporting her loyally in both her musical and acting endeavors. Alexz got her start singing for local shows and radio stations, landing the lead role of Annie Thelen” on Disney Channel’s original series, So Weird (1999), at the age of twelve. After three seasons demonstrating her acting and singing talent, Alexz got the opportunity of a lifetime, taking on the role of Jude Harrison in the Canadian hit show, Instant Star (2004), which was aired on The N Notework. After showing off both her acting and singing talent on the show for three seasons, Alexz moved on to land the role of “Jude Harrison” on the Canadian show Instant Star(2004) on The N network. The show allowed Alexz to participate in much of the music-making on the show and put out four soundtracks (along with other artists in the later soundtracks, also who appeared on the show). She later starred in her first feature, Final Destination 3 (2006), soon after starring in Lifetime films such as Devil’s Diary (2007) and Stranger With My Face (2009). On February 18th, Alexz released her newest EP, HEART. 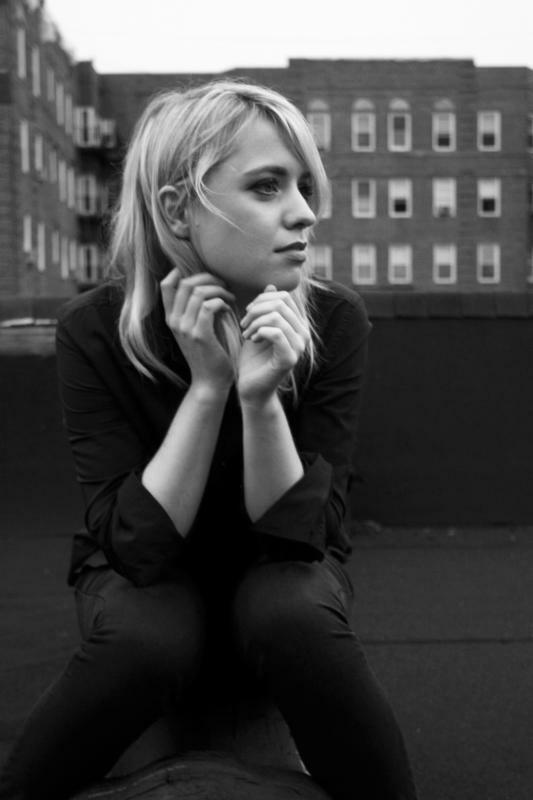 With a unique soulful folk-pop sound and passionate songwriting style, its no wonder Alexz Johnson has been called a modern day Stevie Nicks. She has released three studio albums under her name and tours consistently in North America and Europe. For more information, please visit: alexzjohnson.com. Be sure to catch Alexz Johnson on season three of BLUE on Hulu and Hulu Plus, tomorrow, March 28th. The video was directed by Drew Russ and shot in the band’s hometown of Philadelphia, PA. The band is currently headlining their hugely successful North American run of “The Greatest Generation Tour” with support from Fireworks, Real Friends, Citizen, and Modern Baseball. Due to popular demand, a second show was added in Chicago and most of the dates are selling out quickly, with Philadelphia and New York City already sold out. The band plays a sold out show tonight at the House Of Blues in Anaheim, CA. The pop trio, known as Before You Exit, have released their music video for new hit single, “Dangerous”, this past Saturday, March 22nd, which you can view below. The single, co-written by Connor and Riley McDonough and mixed by Serben Ghenea, was premiered last week on Radio Disney, with the video directed by James Davis II. “Dangerous” is now available for purchase on iTunes, here: http://bit.ly/1iWoylv. The band is currently out on their spring headlining tour with Plug In Stereo as direct support, along with Macy Kate and Spencer Sutherland. The tour, titled The Dangerous Tour kicked off last week in Raleigh, NC. Before You Exit released their new EP, I Like That, last February. The EP’s title track, peaked at #4 on Radio Disney Top 30 Countdown. When you combine the creative intuition of musical brothers with the wisdom and input of chart-topping songwriters, you get an album of finely crafted pop bursting with spirited authenticity. Though the three brothers in Before You Exit were just in their teens, they had the talent, sophistication, and confidence to find their distinct pop-rock aesthetic through writing with such songwriting heavyweights. For more information or to purchase tickets, please visit: http://www.BeforeYouExit.com. The Orlando, Florida-based band of brothers have been playing ever since they were little. The group consists of Connor McDonough, 20, (Vocals/Guitar), Riley McDonough, 18, (Vocals), and younger brother Toby McDonough, 16, (Vocals/Guitar) and they’ve already began to make their mark on the world. Purchase Before You Exit’s new single, “Dangerous”, on iTunes, here: http://bit.ly/1nCcysc. BONUS TRIVIA: Did you know that Before You Exit was one of the first bands featured on Planet Stereo way back in 2010? Don’t believe us? Check out the old interview by clicking HERE (Psst, that is the very first Planet Stereo webpage). Say Anything, the brainchild of front-man Max Bemis, happily announced a brand new full length, Hebrews, due out June 10th, 2014 via Equal Vision Records. The album is the follow up to Say Anything’s massively successful fifth studio album Anarchy, My Dear, released in March of 2012. Say Anything will support the release of Hebrews with a nationwide tour kicking off June 13th at Granada Theater in Dallas, TX. 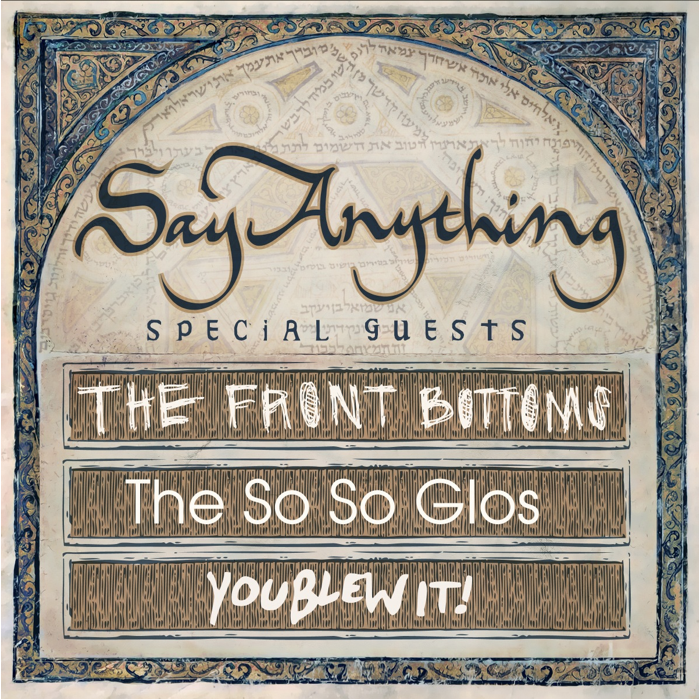 The Front Bottoms, The So So Glos, and You Blew It! are confirmed to support. A signed CD or vinyl can be added to the pre-sale ticket purchase at a cost of $9.00 for CD and $14.00 for vinyl. Fans who choose to add Hebrews to their ticket order will receive a digital download of the record on release date from Equal Vision Records, as well as be able to pick up their CD or vinyl from the merch table the night of the show they are attending with confirmation of their order by showing their ID and receipt of purchase. Additional unique pre-order bundle options will be available through MerchNOW in the coming weeks. w/ The Front Bottoms, The So So Glos + You Blew It! Tagged Anarchy My Dear, Brand NEw, Common Ground Music Festival, Equal Vision Records, Granada Theater, Hebrews, Max Bemis, MerchNOW, new album, New Releases, planet stereo, pre-orders, pre-sale, Saves The Day, Say Anything, The Front Bottoms, The Hold Steady, The So So Glos, tickets, tour dates, You Blew It! 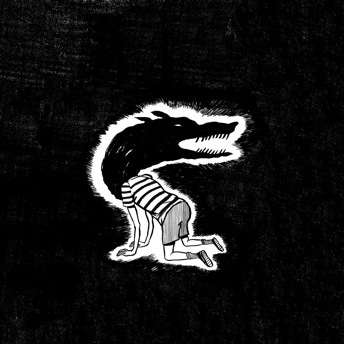 Hailing from Detroit, Fireworks have released their highly anticipated album Oh, Common Life today! To show your support, the album can be purchased digitally now on iTunes: http://bit.ly/1hhGcO1, physically through Merch Direct, and on stops of the band’s current tour (dates listed below). Hot Topic stores are carrying an exclusive, orange vinyl pressing of the record. The band is currently touring North America with The Wonder Years, Real Friends, Citizen and Modern Baseball. The tour has already sold out many of the scheduled dates. The band performs tonight in San Diego, CA. Fireworks are also confirmed for this year’s Bled Fest in Howell, Michigan on May 24th with The Menzingers, Title Fight, Man Overboard and many more. Tickets for the festival can be purchased at http://bit.ly/1dhCOBQ. Comprised of David Mackinder (vox), Brett Jones (lead guitar), Chris Mojan (guitar), Kyle O’Neil (bass), and Adam Mercer (keys), Fireworks is a band filled with electric personalities and endless influences, who have shared the stage with acts such as New Found Glory, Saves The Day, The Starting Line, All Time Low and many more.